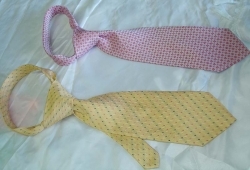 These are ties a budget, delve into subtle and off beat colours. They are in. No abstracts, but symmetrical with chequered pattern, wide checks or diagonal stripes.